Unfortunately, I was unable to blog about last week's Shop of the Week for Etsy's Twitter Team - so I wanted to make up for that and get in a belated post for Wellspring Creations! blending both unique stones and her wire wrapping techniques, she shows us all how amazing simple objects are turned into wearable art. "Michaelangelo said that the marble told him what to carve...what it was meant to be. Similarly, I take great care to present each special stone in a setting that not only looks lovely, but is specially chosen to enhance its beauty." This exquisite Deep Pink Rhodochrosite Pendant (above) has lovely white markings; it is an unusually high quality stone--referred to as "gemmy" by the trade. The setting is a wire wrapped sterling silver "net" that gives an airy appearance to this very feminine stone. 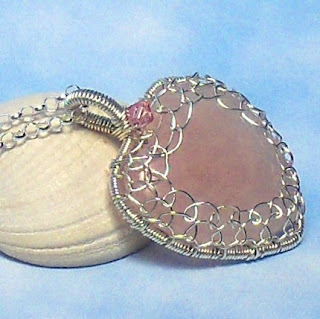 This lovely Natural Pink Rose Quartz Silver wrapped Pendant (above) is carved in a heart shape. Carefully wrapped in sterling silver wire, each side is different--it's like two handcrafted pendants in one. One side is sweeping loops topped with two asymmetric coils; the other, delicate netting topped with a swarovski crystal. Find these and many other wonderful items at Judy's shop, Wellspring Creations. "THE CURE" earrings where 20% goes to SUSAN G. KOMEN/BREAST CANCER.